This Teriyaki Glazed Salmon with Peach Salsa is a great recipe to kick off your cooking this year. It’s light, super healthy and easy to make when you have a “garden in your pantry”! New Year’s Resolution #877: Cook more at home. I know, I know. It doesn’t make sense for a food blogger to say that. Let me explain. After spending the day “working” on my blog; i.e. baking 2 cakes, pinning up a storm and filming a tutorial on how to chop onions, I realize I didn’t cook anything for dinner and we don’t usually eat cake for dinner. All this has recently led to an increase in eating out. When my hubby and I got married over 10 years ago, we ate out a lot! A few months into it, we made a decision to cook more at home and we both dropped 5 pounds. Cooking at home meant we didn’t have to be on any of these new torture diets. 1. 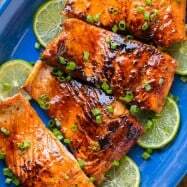 Combine 1 Tbsp teriyaki sauce with 1/2 Tbsp lime juice and 1 1/2 Tbsp honey. Your honey should be in liquid form. If it’s not, heat it up in the microwave or over a bowl of hot water. 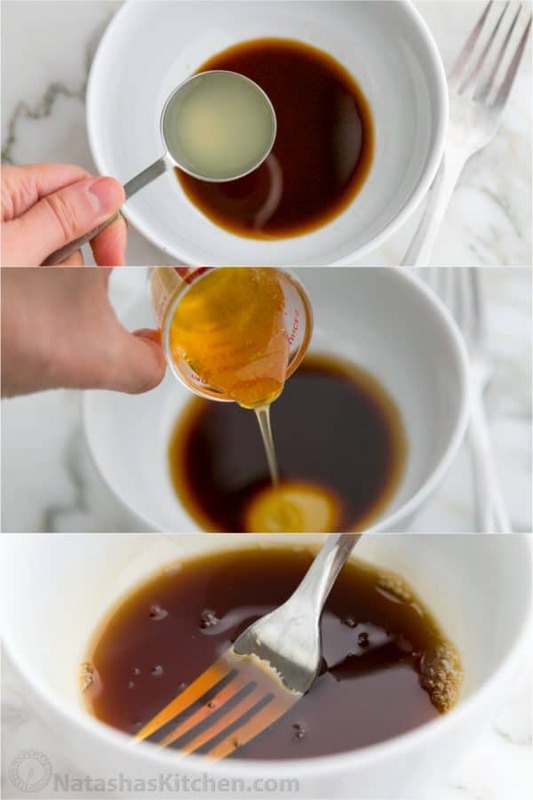 Whisk it all together until you have a consistent syrup. 2. 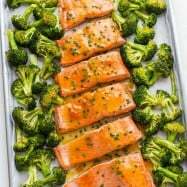 Cut salmon into 4 equal pieces. Place them in a quart-sized ziploc and pour marinade over the top. 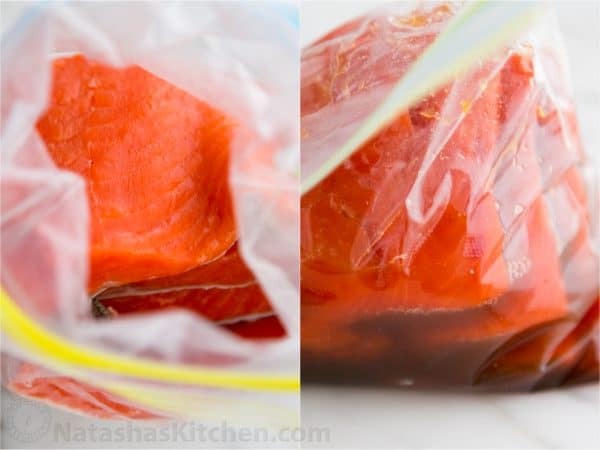 Mix it up in the bag to coat the salmon evenly. Let marinate for 30 minutes in the fridge, rotating the fillets every 15 min. (Meanwhile make your salsa). 3. 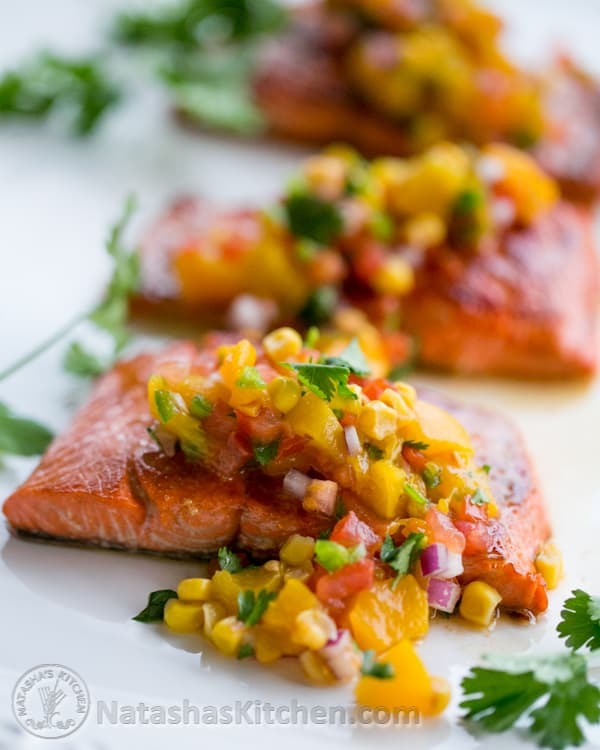 Once your salmon is done marinating, heat a large non-stick skillet over medium heat and add in 2 Tbsp olive oil. 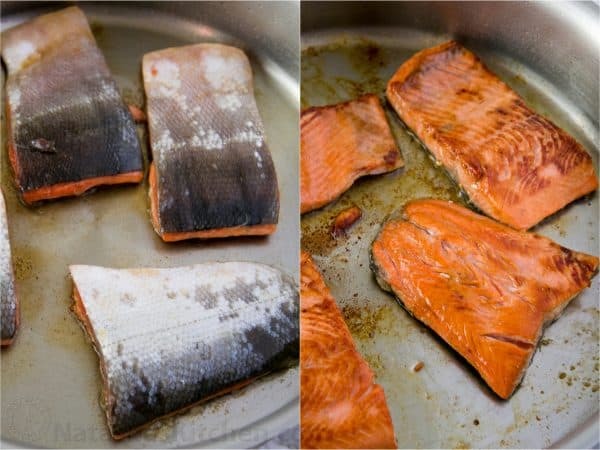 Once the oil is hot, Add salmon, skin side up and saute 3-4 minutes, then turn over carefully and saute another 4 minutes or until salmon reaches desired doneness and is flaky. If your salmon pieces are smaller like mine were, it’s just 3 min per side. Adjust times according to the thickness of your salmon. 1. 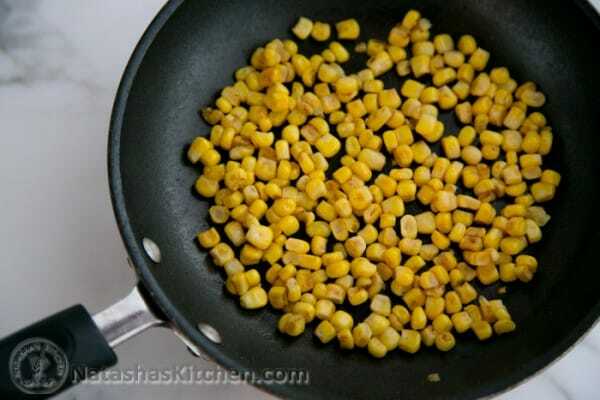 Drain corn well and sauté for a few minutes on med/high heat until roasted and browned. Set aside to cool. You don’t have to roast them. It’s up to you. 2. Drain your peaches well and pat dry them a little with a paper towel. Chop peaches. Chop tomatoes and finely dice onions. Finely mince your jalapeños. Chop your Cilantro. 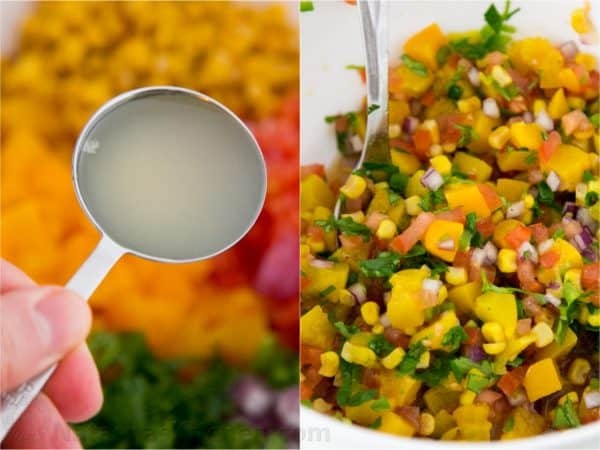 Add all of these veggies, peaches and your corn to a medium mixing bowl. 3. Stir in 1 Tbsp lime juice (fresh squeezed is best) and add Salt (1/4 tsp) and Pepper (1/8 tsp) to taste. 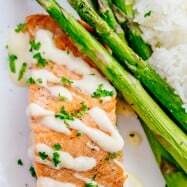 Stir to combine and serve a generous amount over each salmon piece or refrigerate until ready to serve. If you have any leftover salsa, take some tortilla chips to it ;). 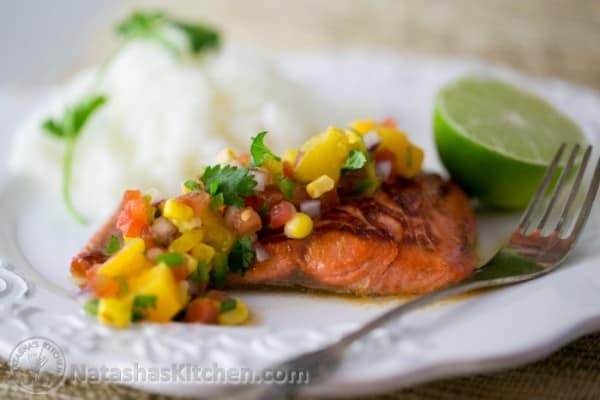 We paired this teriyaki salmon and peach corn salsa with fluffy white rice. 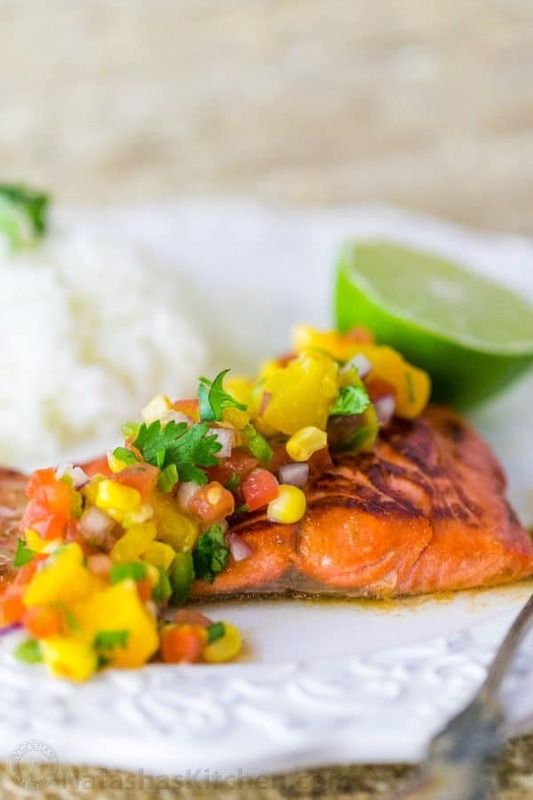 We paired the teriyaki salmon and peach corn salsa with fluffy white rice. 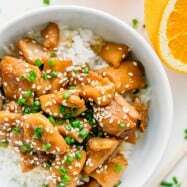 Combine 1 Tbsp teriyaki sauce with 1/2 Tbsp lime juice and 1 1/2 Tbsp honey. Your honey should be in liquid form. If it's not, heat it up in the microwave or over a bowl of hot water. Whisk it all together until you have a consistent syrup. 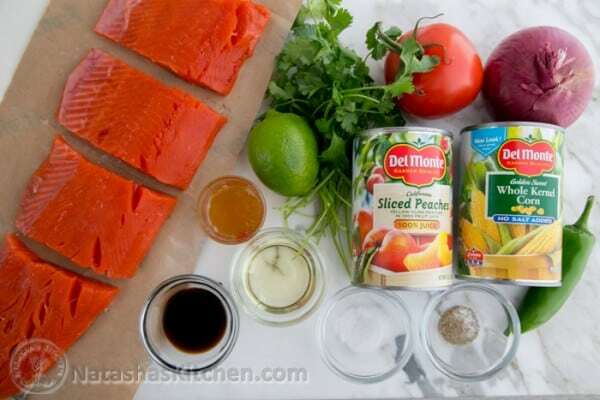 Cut salmon into 4 equal pieces. Place them in a quart-sized ziploc and pour marinade over the top. Mix it up in the bag to coat the salmon evenly. Let marinate for 30 minutes in the fridge, rotating the filets every 15 min. (Meanwhile make your salsa). Once your salmon is done marinating, heat a large non-stick skillet over medium heat and add in 2 Tbsp olive oil. 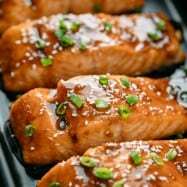 Once the oil is hot, Add salmon, skin side up and sauté 3-4 minutes, then turn over carefully and sauté another 4 minutes or until salmon reaches desired doneness and is flaky. If your salmon pieces are smaller like mine were, it's just 3 min per side. Adjust times according to the thickness of your salmon. Drain corn well and sauté for a few minutes on med/high heat until roasted and browned. Set aside to cool. You don't have to roast them. It's up to you. Drain your peaches well and even pat dry them a little with a paper towel. Chop peaches. Chop tomatoes and finely dice onions. Finely mince your jalapeños. Chop your Cilantro. 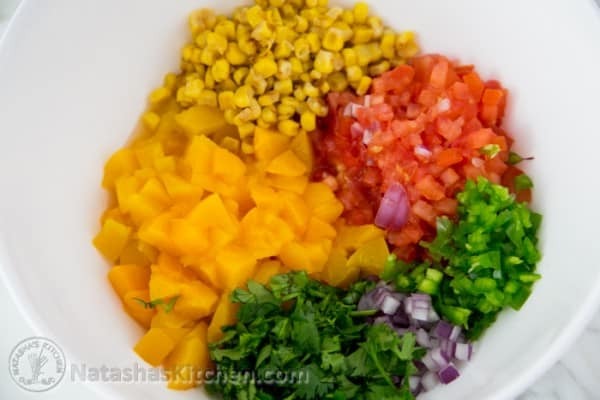 Add all of these veggies, peaches and your corn to a medium mixing bowl. Stir in 1 Tbsp lime juice (fresh squeezed is best) and add Salt (1/4 tsp) and Pepper (1/8 tsp) to taste. Stir to combine and serve a generous amount over each salmon piece or refrigerate until ready to serve. Tomatoes, pineapple, beans and corn. 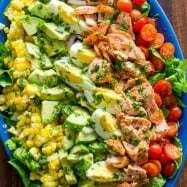 I love this recipe and can’t wait to try it! Here’s what I like to keep: Tomatoes are always handy for cooking. I love bananas and apples. Also peaches when they are in season. Thank you for a great blog, your recepes are great! And thanks for giveaways! P.S. I love your blog not only because you have such great recipes, but because you’ve tested them and they’re written in common English for those of us who are not professional cooks. Thanks so much for the inspiration!! I like to have French cut green beans, corn, sweet peas (my daughter loves those), mixed fruit, and pineapples.